The Showgirl Competition is definitely not a beauty pageant. Entrants must have a genuine interest in, and knowledge of, rural NSW. The Competition encourages the participation and awareness of issues faced by women in rural NSW. Contestants are judged on personality, confidence, ambition and life goals, general knowledge, rural knowledge, presentation and speech. Finalists must also demonstrate knowledge of their local community and current affairs. In addition to their potential ambassadorial qualities, contestants are also judged on their involvement in and experience of rural affairs. Today, contestants continue to be young rural women with purpose and ambition and the Competition plays a significant role in the overall development of rural youth, attracting strong support from entrants, sponsors and organisers. Over 500 young women enter the Competition annually throughout NSW, with competitions run by around 120 Show Societies. The Sydney Royal Showgirl acts as an ambassador for rural NSW with her role involving many official and informal duties both at the Sydney Royal Easter Show and during her travels within NSW and overseas. Click here to visit the Royal Agricultural Society of NSW Showgirl competition page. 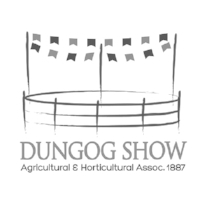 The Dungog Showgirl winner will compete in the Group 3, Hunter River Zone (comprising Bulahdelah, Cessnock, Dungog, Gosford, Gresford, Maitland, Merriwa, Morisset, Muswellbrook, Newcastle, Singleton, Stroud). The winner of Zone goes on to compete at Sydney. All local girls, between the ages of 18 and 25 are encouraged to apply. Being a Showgirl means being involved in our local community and the Dungog Show; presenting prizes, sashing winning livestock, speaking with media and generally being in the public eye. The announcement of the winner of the Dungog Showgirl is a major attraction to our Show. Please register your interest with Kathy MacDonald who will guide you through the steps. To compete in the Showgirl Competition is exciting and challenging. To support your journey the Dubbo and Nowra Show Society run an annual Personal Development day/weekend for Showgirl entrants. All girls are encouraged to attend as they prepare to enter their local and/or Zone Showgirl Competition. This blog is a great resource in preparing for your Showgirl entry. Click here to visit.